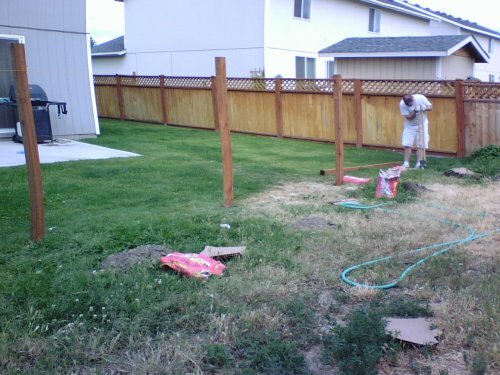 Wednesday morning hubby-Eric got up extremely early and dug three post-holes for the new backyard fence. When I managed to drag myself from bed to help, I covered the holes with cardboard to hopefully keep any kids from breaking a leg by running through our yard and not seeing them. 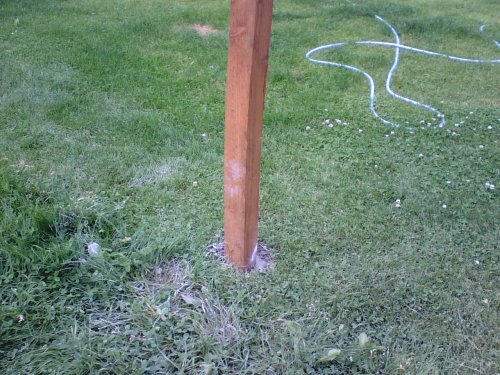 Thursday morning, heroic-hubby-Eric managed to dig another five post-holes. Wowsa. Later in the afternoon, Eric's parents arrived and Eric and his father went to get the wood and concrete for the fence posts. We then went out for a lovely dinner. This morning, Eric and I dragged ourselves out of bed late, and when Eric's parents arrived Eric dug the final post-hole and then Eric and his dad started putting the posts up while Eric's mom and I started to tackle the weeds in the yard. Eric managed to set all nine posts. In the meantime, Eric's dad realized that the yard was too weed-covered for me to handle, and took me down to Ace Hardware and bought me a gasoline mower. I now have a little gas mower! I mowed the entire lawn, and would have mowed it a second time except I was afraid of going overboard. I've been informed that I must name the mower, so I'm trying to think of a male name that fits. 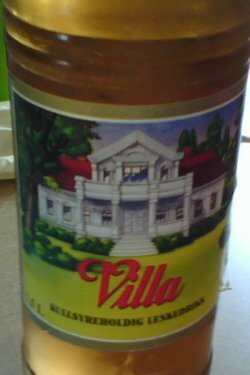 It's a very good apple cream soda, I enjoyed it a lot and if I was a soda drinker anymore I'd certainly wish to have more of it. After lunch, Eric and his father started putting the top bar on the fence, which I haven't got a picture of yet. They finished the top bar, I finished mowing, mom-in-law weeded the property line between my yard and the neighbors. Then we all went and rested for a couple of hours before going out for dinner again. Ah, flan! How I love you! Tomorrow we hope to finish the fence... well, hubby-Eric hopes to finish the fence. I will probably work with mom-in-law on the yard. Hopefully we'll have another day like today with lots of pleasant clouds instead of hot sun.